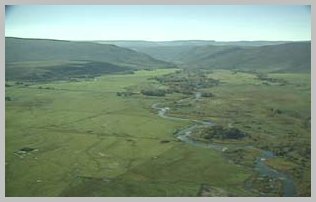 The Flat Tops Trail Scenic Byway cuts through the heart of the original White River Plateau Timberland Reserve, set aside in the late 19th century as the second unit of what eventually became the National Forest system. Two decades later, in a foreshadowing of the 1964 Wilderness Act initiated by Arthur Carhartt, development of any kind was banned around Trappers Lake (the "Cradle of Wilderness"). The areas long-standing history of preservation and multiple-use land management makes for pristine scenery and superlative wildlife viewing. Yet this remains very much a "working" byway, dotted with active mines, ranches, and timber-producing woodlands. 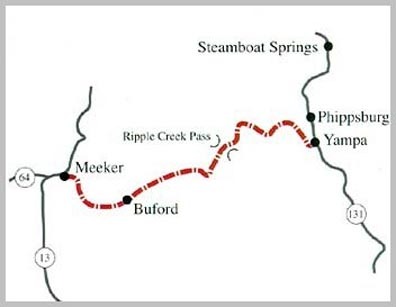 Meeker and Yampa, the routes two endpoints, embody the rugged individualism that lies at the heart of western lore. Check out the video "Island Of The Rockies", Sights and Sounds of the Flat Tops Wilderness. This 62 minute video, filmed in 1997, shows all the beautiful country that was under siege by the 17,000+ acre "Big Fish" fire of 2002. You can access the Flat Tops Wilderness from several different points along the Flat Tops Trail Scenic Byway. Special considerations: Fill tank in Yampa, Buford, or Meeker; roads muddy when wet. The byway is closed for much of the winter, but is used extensively by snowmobilers. There are many good reasons to buy Colorado property. The new homes in Colorado Springs are affordable and are in beautiful developments. Colorado homes are great for the family life, but Colorado real estate is good for investing too.